John moved to Ontario, Canada. Kate married Charles Arthur Hutchinson. Joseph married Kate Collinson from Folkingham and moved to Derbyshire, then Sheffield. Henry stayed at home, working on his parents’ farm. He died 1924, aged 44. Margaret married Harold Eccles in London and moved to California. Arthur also moved to California and worked in life insurance. Albert married Esther Jackson in 1917, by 1919 they were living at Holywell Farm, Fulbeck. Harold died 1911 in Calgary, Canada. Victoria May married George Partridge in Edinburgh, she died in 1939 in North Collingham. Grace was in Edinburgh in 1919. She married John Cathels. She died in 1992. Frederick Victor died in infancy in 1898. Charles Garrett Hutchinson also went to Canada, where he joined 10th Battalion, Canadian Infantry in Sep 1914. They sailed to Europe in Feb 1915 and that April he was wounded in the left arm at Ypres. During 1917 he was rapidly promoted to Staff Sergeant. He also got married in Essex. In 1919 he was in a Canadian Convalescent Hospital in Wokingham. In 1901 Edward (17) was an apprentice baker at Reepham Post Office (NE of Lincoln). In 1907 he married Emma Squires. They moved to Fulbeck. where Edward worked as a farm labourer. By 1911 they had 2 daughters: Evelyn Katherine (born c 1908) and Millicent (born c1911). Edward was fined by the court twice during 1913; for using bad language at Fulbeck and refusing to leave the Hare and Hounds in April. And in October the same year he was fined 5/ for causing a disturbance. He volunteered for the Army on 3rd Aug 1914 (giving his trade as baker) and joined 2nd Battalion, Manchester Regiment. He may have had previous military service as he was sent to France on 21st Sep. He was killed in action at Festhubert on 26th October 1914 during the Germans attacks during the Battle of La Bassée; he was 31. He has no known grave but his name is on the Le Touret Memorial near Bethune and on the Fulbeck War Memorial. His son, Edward, was born 2 months later. In 1902 Ralph was taken to Lincoln Hospital after breaking his leg when he fell off a horse. In 1911 he seems to have been out of the country, perhaps in Canada. On 31 Aug 1914 he joined the Lincolnshire Regiment in Lincoln, giving his occupation as farmer. He sailed to France on 26th Jan 1915 to join 1st Battalion, Lincolnshire Regiment. Two weeks later he was shot in the leg at Rouen and was sent back to England on a hospital ship. He returned to France on 25 May. He was killed in action during the Battle of Loos, at Bois Grenier near Armentieres on 25th Sep1915. He was trying to save his pal L/Cpl Harold Cooling who had been at his side for months. After they’d taken a German trench, Cooling had been sent back with some prisoners but had been wounded (presumably by shellfire) behind the British lines and sent to hospital. Meanwhile, as they pulled back from the German trench, Ralph was hit in the thigh by a shell fragment. The wound was bandaged and Ralph was advised to stay in a dugout until the shelling abated. 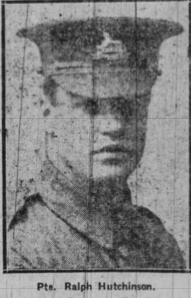 But Ralph heard that that Cooling had been left badly wounded in the German trench and went to search for him, despite knowing that the Germans had probably re-occupied the trench. As he re-crossed no man’s land he was hit in the head by shellfire. He was dragged back to the British dugout but died of his wounds. He is buried at White City Cemetery, Bois-Grenier and his name is on the Fulbeck War Memorial. There is also a memorial gravestone to Ralph and Edward in Fulbeck Churchyard.